Opec, the oil producing cartel, has warned that the price of crude could keep rising to reach $200 a barrel. Opec president Chakib Khelil blamed the falling value of the US dollar, which makes other assets, including oil, more attractive for foreign investors. His comments came as oil prices hit a fresh high, just below $120 a barrel. Prices were lifted by a strike at a UK refinery that disrupted North Sea production, and supply problems in Nigeria due to pipeline attacks. 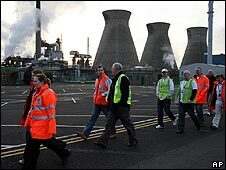 BP shut down a key North Sea pipeline at the weekend after staff walked out of the Grangemouth refinery in Scotland in a two-day strike over pensions. Providing a third of UK oil output, the closure of the Forties pipeline has raised fears about supply shortages. US light crude hit a high of $119.93 a barrel before edging down to finish at $118.79. In doing so, it passed the previous record mark of $119.90 a barrel achieved on Friday. In London, Brent crude ended at $116.74 a barrel after earlier rising to a peak of $117.51 a barrel on Monday. The BP-run pipeline from the Forties oil fields in the North Sea relies on steam and electricity from the Ineos refinery at Grangemouth. Grangemouth's closure has caused up to 70 platforms in the North Sea to either shut down or reduce production of oil, resulting in the loss of 700,000 barrels of oil a day. Although BP has said it can re-open the pipeline within 24 hours of the strike's end on Tuesday, it will take weeks for the refinery to return to full capacity. "It will affect supplies from the North Sea and that has a potentially significant impact," said David Moore, a commodity strategist with the Commonwealth Bank of Australia. The trouble at Grangemouth is the latest spur to an already febrile oil market which has seen prices rise nearly 25% this year. Regular attacks on oil facilities in Nigeria, the weak US dollar and general concerns about the ability of supply to meet global demand have underpinned the market this year. Oil producers' body Opec has shown itself disinclined to raise quotas to curb rising prices. The dollar's decline has also made dollar-denominated assets such as oil and other commodities relatively cheap for some investors. "We have got a confluence of a number of events that have really disrupted crude oil supply and that's what's driving oil to a new record," said Victor Shum, from energy consultants Purvin and Gertz.